The President of the United States just denied the official death toll from Hurricane Maria and blamed it on Democrats. This is among the lowest statements made by any American president. President Donald Trump called into question the death toll in Puerto Rico following Hurricane Maria on Thursday — which officials recently estimated at nearly 3,000 — dismissing the number as a conspiracy concocted by Democrats. As Hurricane Florence barrels towards the east coast of the United States, the Trump administration’s response to Maria in Puerto Rico has come under renewed scrutiny. Puerto Rico’s government, after maintaining that 64 people had died as a result of the storm, raised the official death toll to 2,975 last month. Trump on Tuesday, when confronted with the massive spike in the death told, told reporters he thought the U.S. response was successful. Now Trump — who is spending his morning watching Fox & Friends — is going so far as to call into question the official death toll on the island. Nearly 3,000 people died in the aftermath of Hurricane Maria in Puerto Rico. President Donald Trump denied this reality as a hurricane barrels toward the Carolinas. “3000 people did not die in the two hurricanes that hit Puerto Rico. When I left the Island, AFTER the storm had hit, they had anywhere from 6 to 18 deaths. As time went by it did not go up by much. Then, a long time later, they started to report really large numbers, like 3000,” he said in a tweet Thursday morning as Carolinians prepared to be pummeled by Hurricane Florence. Earlier this month, the island’s governor formally raised the death toll from Hurricane Maria to an estimated 2,975 from 64 following a study conducted by researchers at The George Washington University. CNN’s own reporting reflects similar numbers. The university study accounted for Puerto Ricans who succumbed to the stifling heat and other aftereffects of the storm and had not been previously counted in official figures. Much of the US territory was without power for weeks. His comments run counter to how many locals and experts have assessed the federal government’s response. The Washington Post offers this fact check in the wake of Trump’s latest tweets, which also puts into political perspective what he is trying to do. Here is the bottom line politically: members of his base will now take up his argument (this is the pattern and you can already see it on some weblogs and websites). But the GOP’s problem in the mid-terms is trying to stem the flow of educated women, independent voters, and even anti-Hillary Democrats who voted for Trump in 2016, giving him the benefit of the doubt. Polls show that he is now losing those groups in droves. This story will also add to the narrative in Bob Woodward’s book “Fear.” So he won’t change a lot of minds with his tweets except, most likely for some voters who polls show are feeling a)voters’ remorse b)want a branch of government to provide a check on the Executive branch. His base is already with him. This will do little, nothing or damage to the GOP’s hopes to halt the bleeding of constituencies that created the winning coalition for Trump on election day 2016. BREAKING: Trump states without evidence that Puerto Rico hurricane death count is plot by Democrats to make him look bad. 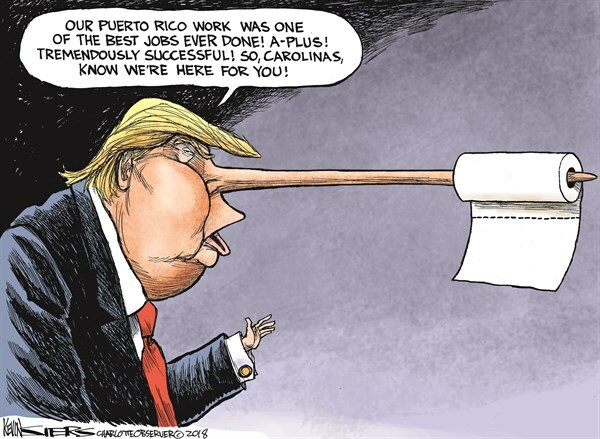 When Trump tells a lie — as with the handling of the disastrous Puerto Rico hurricane — the magnitude and repetition of the lie is in direct proportion to how fully he believes he is guilty of the charge being made against him. BREAKING: Pres. Trump rejects independent study that reports an estimated 2,975 people died in Puerto Rico in 5 months after Hurricane Maria; provides no evidence to discount the study; declares, without evidence, that the higher death toll is political ploy to make him look bad. This mornin' Trump claimed the 3000 deaths in Puerto Rico were faked to make him look bad. Next, he'll tell us those kids locked themselves in those cages. “HURRICANE MARIA WAS AN INSIDE JOB” — The president in his next tweet, probably. 20,000 pallets of bottled water meant for the victims of Hurricane Maria has sat untouched on a runway in Puerto Rico for an entire year.